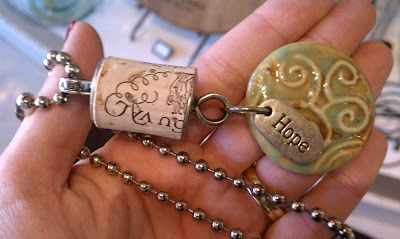 Women on a Mission: Mom Edition: CORK NECKLACE! I made my way over to the store (Good Things) and took a couple of pictures. I knew instantly that I would be able to re-create it. The Good Things necklace cost $29.95. Not too bad, but I set out to make myself a necklace for far less than that. The key is to shop around. Buy from JoAnn if you can – they often have lots of sales on jewelry-making supplies and all of their bead stuff is fairly economical. You’ll need a rounded tip pliers, a regular, fine-tip pliers, a metal nipper and accessories such as headpins and jumprings – this is for general jewelry-making. For this project, you’ll also need two washers with a small center opening (go to the hardware store) and two small eye screws (hardware store). Take a cork with you so you can make sure the washers aren’t too big. I used gorilla super glue to adhere the washer to the cork and to put on the screw threads before screwing it into the cork. Total cost: less than $1 not including the super glue which I already had. For the beads, I chose a ceramic bead from Garden of Beads that reminded me a lot of what the sample necklace looked like. Cost: $3.50. I wanted a bead/charm that had a word on it, and I settled on ‘laugh’ since it’s my favorite thing to do. Cost: $1.50 at JoAnn. I added a third dangle of sparkly bluish beads for some glam. I already had the headpin and beads, but they would cost a buck or two to purchase. I had to buy the round jumprings to hold on the ceramic bead to the eye screw. The Garden of Bead lady sold them in packages for about $2 and she recommended I use two for extra strength. And lots leftover. Lastly, I wanted the metal ‘dogchain’ type of chain, like the sample necklace. The shiny silver I bought was $6 per foot and I bought 2 feet. Gulp. I like the shiny silver, so I am fine with the purchase, but I think any more necklaces I make will use the 2’ stainless steel version at JoAnn for $1.50. My necklace cost about $15 to make (I factored in that some of my supplies will be usable for other things and some of my beads I already had), but if you get the more economical (and virtually identical) chain from JoAnn, the price is dramatically less than the original $29 necklace. Isn’t it cute? And THRIFTY? It would make a great gift and you could totally specialize it by using a cork from a special bottle of wine (like the bottle you drank the night you got engaged or, if a gift, from a bottle of wine or champagne which was used for toasting at a friend’s wedding). I saw the same kind of necklace at a gift shop while I was wine tasting, and I immediately thought, "I could make this!" I set out to try to find the materials, but was coming up short--this post really helped me out. Thank you so much! I am looking for a "make & take" jewelry project for a Girls Night Out @ my home, celebrating my youngest daughter's upcoming wedding...there will be about 20 woman from 27-67 years....I think this will be a fun item for all of us to design & make! Thank you for the detailed instructions & photos!